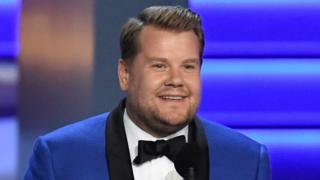 British star James Corden has said he is "thrilled" to be hosting the Tony Awards in New York for a second time. "The Broadway community is very dear to my heart, and I'm beyond proud to be part of this incredibly special night." The British star dedicated that night to celebrate the diversity of Broadway, saying: "Your tragedy is our tragedy." He added: "Theatre is a place where every race, creed, sexuality and gender is equal, is embraced, and is loved. Hate will never win." The Tony Award team were clearly delighted at the prospect of Corden taking the reins again for this year's ceremony at Radio City Music Hall on 9 June. "Hilarious. Insanely talented. Musical savant. Brilliantly unpredictable. James Corden!" said Tony Awards executive producers Ricky Kirshner and Glenn Weiss. The Hollywood Reporter praised Corden following the 2016 show for "showing sound judgment" by dealing "with the [Orlando] tragedy upfront in solemn pre-show comments". Hamilton swept the board at that year's Tonys, picking up 11 Tonys.